One of the things I most missed about blogging while I was in and out this year was discussing books with you guys. Thus, one of the first things I did when I came back to blogging was to plan a buddy read with one of my favoritest and longest-lasting blogging friends, Ana of things mean a lot. We chose to read Hope Jahren's memoir Lab Girl because reading about women rocking the science world seemed like a really nice thing to do after the horrors (that continue) of Brexit and the American Presidential election. Lab Girl is written by a plant biologist who does research on topics that seem to be quite fascinating (at least at the macro level. At the micro level, it seems like a lot of sorting through dirt). She writes about how she got into biology, her life as a biologist, and her friendship with someone who is hugely important to her personal and professional life. Throughout the book, there are vignettes that describe the life of a tree, from seed to seedling to battling disease and other threats to communicating with other plants. Those vignettes are beautiful. Aarti: I didn’t know much about the book at all until you suggested it as a buddy read, so I didn’t have many expectations at all besides the summary. 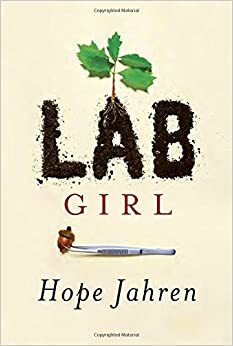 Based on that, and the title of the book being Lab Girl, I thought it would be more about Hope Jahren’s research and studies and all the struggles the science community faces, from funding to research to reporting to reviewing. That’s not quite what I got, though I still enjoyed the book. My favorite sections of the book were the vignettes about trees. I thought those were so beautifully written and really showed me just how active a tree’s life can be. I loved reading about how they communicate with each other, how they decide when to germinate, how they grow through adolescence and adulthood, and how they try to fight disease. It was just so wonderful, and I could read a whole book that was just more of those vignettes. That said, I found other parts of the book a little… self-congratulatory? It felt a bit like Jahren wanted readers to know that even though she’s a really smart plant scientist, she’s also super witty and funny and likes a good prank. It seemed a little forced, especially compared to how earnest other portions of the book were that were so strong. For example, the feeling Jahren described when she made her first real scientific discovery. Or the misery of being pregnant without access to her medication. Those parts were so beautiful and moving, and I just wondered why she sometimes felt the need to make herself out to be so flippant. Why did she have to be so callous and unkind towards her students when she described in detail to us just how much of an outsider she felt? It was as though she wanted everyone to think she was the jock of the science community. As for her friendship with Bill, I feel like she made it out to be more at the end than it was during the book itself. That’s not to say that I don’t believe that she and Bill have a deep and strong and wonderful friendship. I just don’t think that she wrote a book about the two of them in the way she implied she did at the end. Maybe that’s because the book seemed to be more snapshots and vignettes than a cohesive story. For example, she describes her mother in detail at the beginning and then hardly ever again. She talks about memory lapses at one point and never mentions why. She briefly talks about being bipolar, but never in conjunction with anything else, so we don’t really know how it impacts her life. And then she shares some small, lovely moments with Bill (and some not-so-lovely ones), and tells us the whole book is an homage to him and their friendship. It sounds as though I did not really enjoy the book, and that’s not quite true. Parts of I truly loved and found so moving. That’s why the other parts were so jolting, I think. Ana: I think our feelings about this book are very similar, though to be honest by the end of it I wasn't sure how much I had enjoyed it. I started out really liking it and feeling very captivated by Jahren's voice, as I told you when we messaged briefly; by the end, though, I was a little tired of it, though like you I really enjoyed the science sections. Part of me wonders if it was because it took me longer than normal to read it, which is much more about my circumstances than it is about the book itself. So this might be an unfair thing to say, but all the same the exhaustion affected my reading experience. I have to say that Lab Girl was actually very different than I expected. I suggested we buddy read it because I'd heard things about it here and there, and I don't know if it was that or if it was me making assumptions about the title, but I somehow thought this was going to be a science and gender sort of book. It's not a bad thing that it isn't strictly that, of course -- the assumption that all women should ever write about is "being a woman in [insert here]" is tiresome, though I do find those stories valuable when women choose to tell them -- but the mismatch between my expectations and reality meant I had to adjust to the book in front of me. It also didn't help that Lab Girl is, as you say, very disjointed. I don't mind temporal jumps, but some of Jahren's were too abrupt, and left me with questions the narrative never really goes on to answer. I also wanted to know a little more about how Jahren's struggles with her mental health impacted her life and career, and about her relationships with the key people in her life, and about how some of the changes we witness as the book moves from section to section came out. I also felt there was some disconnect between the passion and depth of knowledge Jahren evidences in the scientific chapters and what she tells us about her work in the autobiographical ones. Does that make sense? Lastly, I agree with you that the final framing of the book as a tribute to Bill seemed to come out of nowhere. It's a shame, because I actually loved what we saw of their relationships. I'm very interested in definitions of family that include the emotional ties we chose to prioritise, and in narratives that acknowledge that non-romantic bonds are central to our lives and can last forever. I really liked the scene where Jahren and her husband pick up Bill to go out shortly after they get married and tell him, "You're with us now" -- that was a lovely and moving moment. It's of course ridiculous to assume Jahren can't have a close male friend and also a partner, but the absurdity doesn't make the assumption any less common. For all these reasons, I really wanted to read more about them, and for what Jahren tells us is the book's theme to be woven into the narrative in a way that felt more cohesive. Aarti: Yes to all of this! And I don’t think it’s our fault at all that a book called Lab Girl sounds like it would be more about a woman’s experience in science than about other things. I think the only part that really talked about her experience as a woman was when she was pregnant and went into the office and got very upset when the department head would not let her stay and told her she had to go home. Which… possibly we didn’t get the whole story but considering the circumstances, I personally thought that was a very good move, and she seemed to think it was completely sexist and horrible and that is what caused her to move to Hawaii. Which could very well be the truth, except that as a reader, I didn’t fully follow her journey to anger and resentment, so it was difficult for me to feel the depth of betrayal that she clearly experienced. It’s also possible that I’m a complete stick in the mud, but the whole story she told about renting a van to go cross-country to some conference and recruiting students to drive, and then not even stopping for pee breaks, but making people pee in bottles while sitting in the car? It was absolutely revolting to me. And then forcing them to continue driving through really bad snow, and getting into a huge accident and then having zero ability to figure out what to do with all of these people who were depending on her and Bill to keep them safe. All to go to some conference that she never again mentions in the book. And apparently, it was the students’ faults for being upset with the whole situation? It just felt so immature and selfish. The way she framed it, as though this female grad student was never going to make it because she didn’t want to go on this stupid trip, and as though Jahren was some sort of amazing mentor for forcing her to go… it did not sit well with me at all. Ana: You're not a stick in the mud. I found that story troubling, too, because as you say it describes a group of people being put in an unsafe, stressful situation without properly acknowledging that that's the case. Jahren does tell us that driving into the storm was dangerous, but this was one of the times when the breezy tone of Lab Girl felt very much at odds with the content. And while I know that none of her students were underage, there's still a power differential between professors and students that makes it necessary to take a lot of care in situations like that. Perhaps it's just that the anecdote doesn't do justice to Jahren's relationship with her students, but she comes across as careless. I felt differently about the pregnancy story, mostly because I can easily imagine it coming from a place of complete exhaustion with the dehumanising way pregnant women are treated. It's true that we don't get a whole lot of detail, and it's possible that the university had legitimate safety concerns they wanted to discuss with Jahren. But I completely understood her frustration with the fact that no one spoke to her about it properly before making a final decision -- instead they just changed the keys and locked her out of her own lab. It echoes a cultural trend of treating pregnant women like walking incubators, whose individuality is subsumed by their new role, and as so irrational that they need to be protected from themselves if they refuse to let men make decisions on their behalf. In the end her husband tells her they were probably just afraid of her, but that too felt incredibly patronising and stereotypical. Aarti: That’s a fair point, and I completely agree. It’s not so much that I think she was treated SO well, just that she didn’t give us enough context into the situation for us to make that leap with her to feeling the need to up and leave the institution and move to Hawaii. I thought that if I had a bit more information or background, then I would probably come at the story with more empathy and understanding. I felt like over and over, Jahren would give us bits of a story and not the full picture, and it was hard for me to know if I should trust her interpretation because at other times (i.e., with the whole school van thing), I did not at all trust her judgment on the situation. Ana: I'll tell you about one story that did frustrate me, though: do you remember the bit where Jahren, Bill and a few students are camping in Florida, and one night a police officer shines a light into their tent? She tells us that she came out, charmed the officer with her politeness, and by the end of their interaction she was being offered local tips and nightly patrolling to ensure her safety. Jahren puts it all down to her impeccable Southern manners, but I really, really wish that a book written in 2016 would at least acknowledge that this story would most likely have played out very differently if she hadn't been a white woman. People of colour whose manners are just as impeccable have died in situations like that. Aarti: YES. Well. I agree mostly. Absolutely, being a white woman helps significantly in situations of this kind as no one really viewed Jahren as a threat. (Though the circumstances in this particular instance probably looked super-sketchy, and the police were right to look into it.) And I hope that she is aware of that privilege. That said, I don’t want to feel that everyone who has a positive or neutral encounter with the police should also have to make a disclaimer, “But this could have gone so much worse if circumstances were different!” Because that isn’t really fair to police, either, as though everyone (or at least, certain people) who interacts with them and doesn’t die should feel like they (literally) dodged a bullet in that situation but who knows how the next one will go. Obviously, it’s a super tense and sensitive topic, and I agree with you that she seemed insensitive in her lack of acknowledgement. But I also feel like her story was about a weird museum and the experience she had there, so I don’t know if it would really fit with the narrative to then also make a comment on police encounters and how fraught they can be for some people. Especially as she doesn’t have personal experience or knowledge of that. I don’t mean to imply that “there’s a time and a place” for it, I just also don’t want all stories about police encounters to become this one story about X or allude to this one story X. In a way, it’s nice to know that she had a friendly and very positive encounter with police. Ana: Yes it does, and I do agree that it shouldn't have to be mentioned *every* time. The reason why I mentioned it in this context, though, is that I got the feeling that Jahren was framing her anecdote as a lesson -- the implication seemed to be that if only other people behaved as pleasantly as she did, they too could have positive interactions with law enforcement officers. Perhaps that's an ungenerous reading on my part, but it's what made me uncomfortable with the fact that race remained the elephant in the room. Aarti: Oh, I see. Yes, I can understand how you would read the scene that way. I think this gets back to our points earlier, that Jahren is very hard to trust as a narrator, so you are never quite sure of what to think of her and her actions. In closing, I’d say - not the book I thought I was going to read, but I’m happy to have read it if only for the opportunity to discuss it with you! I am a little annoyed with myself that I am defaulting to the “I didn’t really like Jahren as the main character, therefore I didn’t like the book” stance. I am trying to be more cognizant of that and not think too much about whether a character is “likable.” But this is non-fiction, and a memoir, so not liking the author that much is very different than not liking a fictional character created to move the story along and make a point. That said, as I mentioned above, the vignettes about trees and how they choose a spot to grow, the way they act as they mature, how they fight off disease and other threats - those were truly beautiful pieces of writing. And I am so, so happy that I read this book if only for the benefit of those short bits. I wish there were more of those. They really brought plants to life for me in a new and wonderful way that I really appreciated. Ana: Yes, I feel exactly the same! I worry I spent too long detailing what didn't work for me, and that therefore what did work kind of fell by the wayside. There's some truly gorgeous science writing in Lab Girl, and I think I'll read whatever Jahren publishes next based on that alone. And I'm really glad we read this book together and got to discuss it, even if it wasn't quite what either of us was expecting. This is so interesting; I've had this book on my B-list for a while, because I had the same "women in science" expectations. It sounds like she was not writing the book she thought she was writing. And I have to say, memoirs with unlikable main characters and/or narrators are a pet peeve of mine. Still, sounds like a real missed opportunity! I loved getting to listen in on your conversation! I agree with a lot of what you had to say. As a scientist, I was really appalled at her treatment of her students and really glad she wasn't my advisor! When Lab Girl came out, I heard several interviews with Hope Jahren and they focused a lot on "women in science", so it was surprising to me that the book wasn't that much about gender. But I think maybe gender is what the interviewers wanted to talk about and maybe also the marketers. I started this and read like two chapters and then sort of didn't pick it up again. I know lots of people that love it, so have to see if I ever pick it up again and what my thoughts are overall! I love the idea of an occasional reading buddy and blogging the conversation. Cool idea! Look at you two beautiful people writing book posts together in different colors. Y'all are awesome and I love you. I just finished the book last night and while I enjoyed it, like you two, it wasn't quite the book I expected or would have liked it to be. I too loved the in between chapters about seeds and trees -- they were my favorites! I wanted more of that! I wanted more of Jahren doing science, talking about her research and the discoveries. I mean she has won science awards! The book was so light and tra-la-la that I found myself wondering how she managed to make those discoveries and win those awards. I wanted more about what it is like to be a woman scientist who is also bipolar and a mother. I wasn't as surprised about the ode to Bill at the end since she talks about him and their relationship all the time throughout the book. Nonetheless, I didn't feel like I got to know Bill all that well and sometimes I wondered why the heck he followed her from lab to lab. Not a horrible book, I did enjoy it, but I can't count myself among the crowd that is gushing about it.